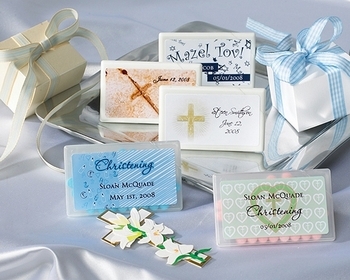 Your guests will love these adorable baby Christening mint favor boxes. Just choose the design style you would like on your boxes and choose the design code in the drop down box to the right to add it to your order. You can also personalize these boxes with baby's name and the event date. Each box is about the size of a credit card making it perfect to be carried in a pocket or purse and uniquely designed with a corner lid that flips open for easy access to the mints. Containers come in white with white peppermints inside. Add an organza bag for only $.35 each. Processing Time 5 business days to print labels. Does not include shipping time. 35 Different Designs Available. See Product Description Below.